Did you catch the Tech Field Day Delegate Roundtable discussion from Interop New York this year? If not, you'll want to watch the replay. We discuss the state of technology conferences, career development for new IT professionals, and why asking the right question is so important. Interop is the last large-scale technology conference that isn't explicitly tied to a single vendor. And that's significant; in the last two years, we've seen new tech conferences pop up that are hyper-focused on specific software. VeeamOn is a good example (I expect Veeam fanboys to furrow their brow with this example). We've seen events like Cisco Live and VMworld balloon into the chaotic frenzies they are. And we've seen independent conferences like Interop dwindle in participation in spite of the many wonderful opportunities to learn and network with great engineers from all over the IT spectrum. Tech Field Day invited me (along with much more knowledgeable folks: Howard Marks, John Herbert, Tony Matke, Jason Edelman, and our indefatigable minder and moderator Tom Hollingsworth) to attend Interop and hear about innovations from Cisco, Glue Networks, Akamai, and HP Networking. The roundtable discussion is a bonus, and in my opinion it's what makes a TFD event unique. Yes, yes: TFD paid my travel and lodging and meal expenses while in NYC. Let's start off with some categorical truths: everyone hates Java, and everyone hates Ask.com. Here's another one: everyone uses Java, and no one uses Ask.com. No one, that is, except for the unlucky souls who inadvertently install the Ask.com browser add-ons and set it to their default search engine during the Java installer. Poor bastards. I only deal with Java these days because my kids play Minecraft. A lot. Not as much as this dude, but still. And since Java receives security patches on a frequent basis (we'll call it weekly, and we won't be far off), I spend time updating Java more often than I'd like. I grew tired of the gratuitous attempts by Oracle to install Ask.com software for you in an opt-out manner. And I'm not alone: many of us have banded together to petition Larry Ellison to stop bundling Ask Toolbar with the Java installer. Sadly, only ~20,000 people of the Internet have signed up. So.... yeah. Until then, here's what you can do to prevent seeing that damned Ask.com screen during the installer. Open your Java Control Panel. Scroll down to the bottom, and find the Miscellaneous section. 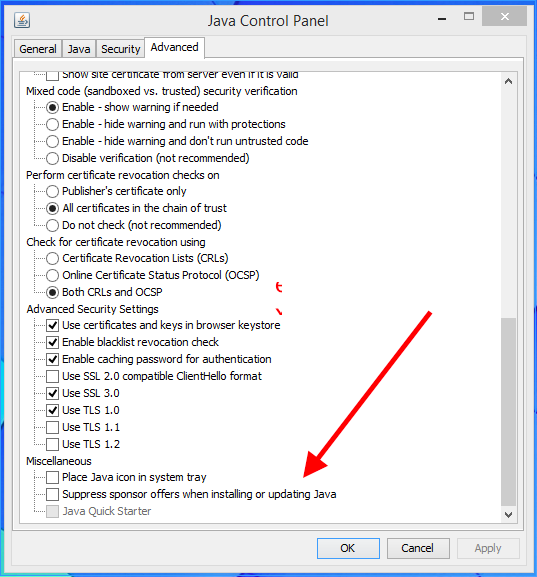 Click the "Suppress sponsor offers when installing or updating Java" box. Now you won't be bothered with that crap Oracle tries to force on you when you install or update future versions of Java.